The Gaia Energy Centre at Delabole has gone into administration due to financial problems. The move was agreed between management at the renewable energy visitor centre and major creditors. 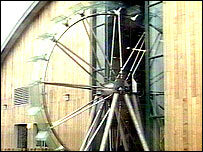 The £5.5m Gaia Energy Centre, at Delabole, was opened in August 2001. But only 52,000 people, half the number of visitors hoped for, have visited the attraction so far. An underlying problem is that it did not get all the grant funding that it had expected when it opened, so management have had to borrow far more than they had planned. It now needs to ensure it is on a proper legal and financial footing, and that means going into administration while its problems are addressed. The centre's receiver, Andy Beckingham, said he hoped to find a new owner so Gaia can continue trading. He said: "It's been a bit of a vicious circle. If there aren't enough visitors generating income then the facility cannot invest in its exhibitions, which in turn leads to a further downturn in visitors. "In recent weeks a very exciting business plan has been prepared, and I am very much hoping that plan can be implemented so people can enjoy the Gaia experience." The centre, which is built next to the UK's first commercial wind farm, features an exhibition on environmental issues and renewable energy. It was set up with help and money from the European Union and the South West Regional Development Agency, and is run by a charitable trust.